I live in Southern California and my best friend Debbie lives in upstate New York. While she left San Diego over 11 years ago, we’ve managed to see each other once every few years. This year we decided to meet somewhere that would be a fun travel destination for us both and chose Chicago for our girls’ weekend trip. 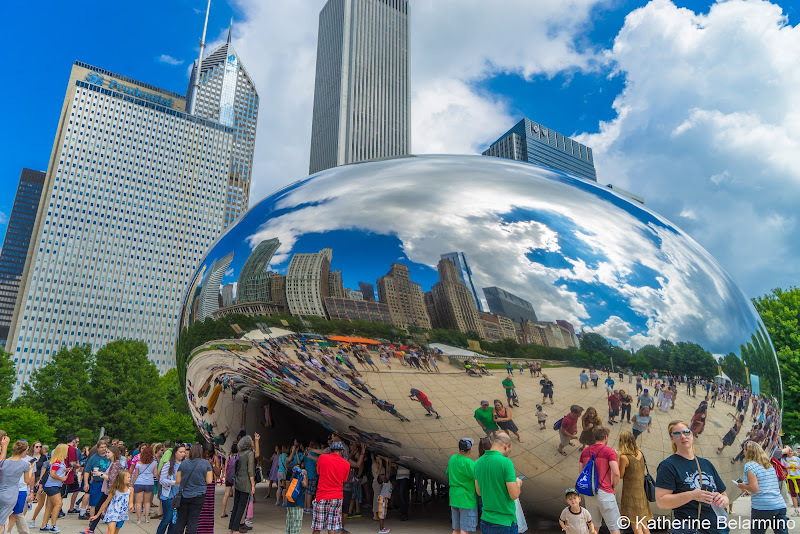 Chicago is a great destination for a weekend getaway as there are so many varied things to do and see. 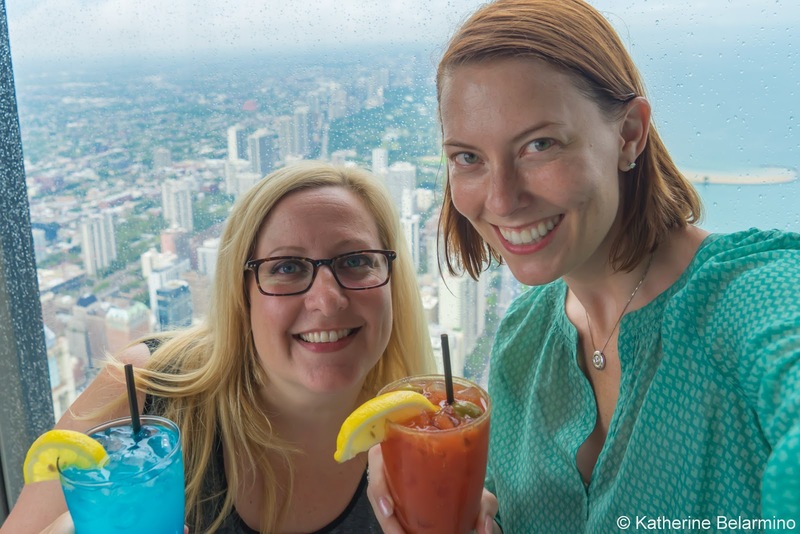 Take some ideas from our girls’ weekend in Chicago to plan your perfect trip. Is it really a girls’ weekend without a trip to the spa? I don’t think so. Our hotel, the Hyatt Centric the Loop Chicago, doesn’t have a spa, so I asked them for their recommendation for a good spa in Chicago. 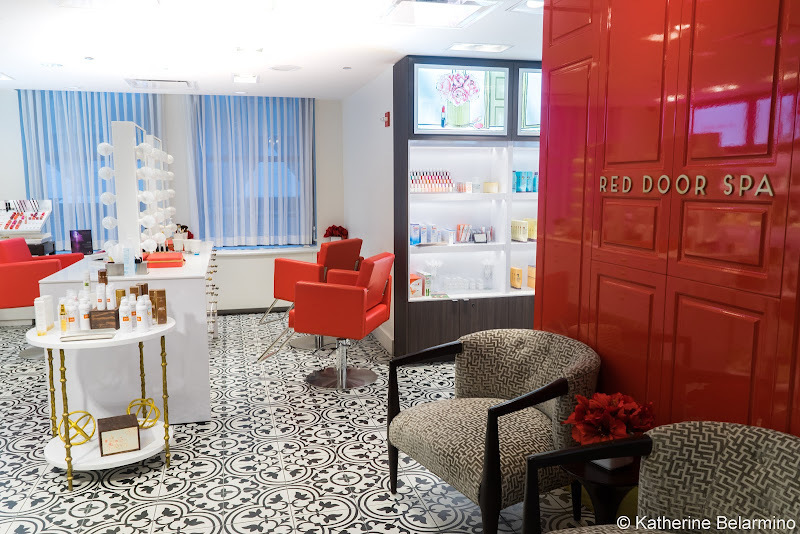 They suggested The Red Door Salon & Spa. I had actually been wanting to try out The Red Door for a while, so our girls’ weekend in Chicago was the perfect opportunity. The Red Door Salon & Spa in Chicago is located on North Michigan Avenue, also known as the Magnificent Mile and the place for luxury experiences. 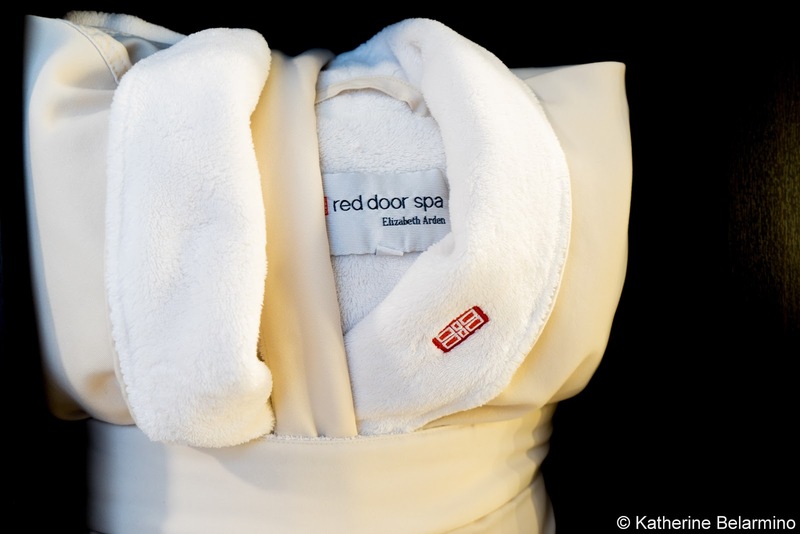 The entrance is on E. Walton Place, where wood paneled elevators rise and open to reveal the spa’s signature red door and an inviting black, white, and red salon. Our spa visit was the perfect start to our Chicago weekend getaway. Debbie tried the seasonal offering of the Mint Julep Body Treatment with a citrus grass salt scrub and a mint julep and lavender hydrating massage. Debbie tells me the massage portion was the best massage she has ever had and she loved how her skin felt and smelled afterward. I guess it shouldn’t really be a surprise that it was the best massage ever since her masseuse Colleen McCaffrey was named Best Masseuse in the Chicago 2015 Salon & Stylist Awards. I had the Elizabeth Arden PRO Renewal Facial. I rarely get facials because I feel like the ones I’ve received in the past didn’t do much and sometimes resulted in redness and breakouts. The PRO Renewal Facial was amazing, courtesy Mirela Munteanu, Esthetic Lead. Not only did my face feel and look fresh afterward, it didn’t get red, it didn’t break out, and the facial actually eradicated some problem spots that I’d been dealing with for weeks. 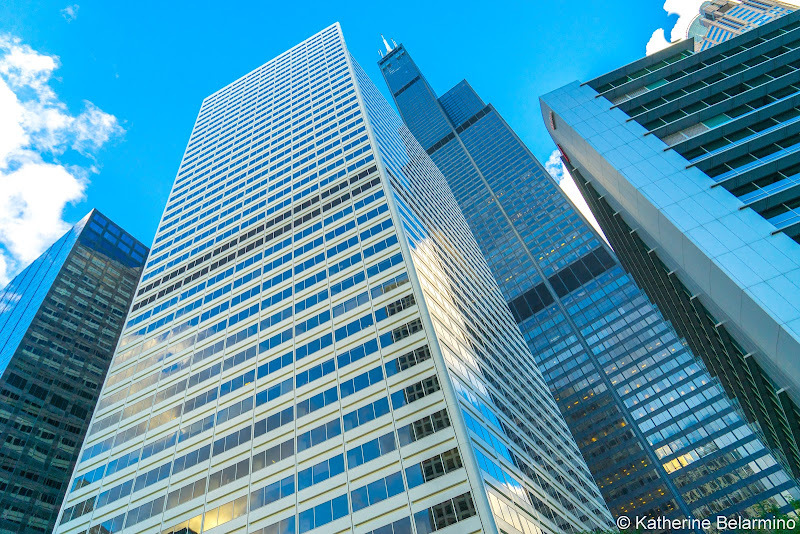 Chicago has two famous skyscrapers to visit, the John Hancock Center and the Willis Tower (formerly the Sears Tower). 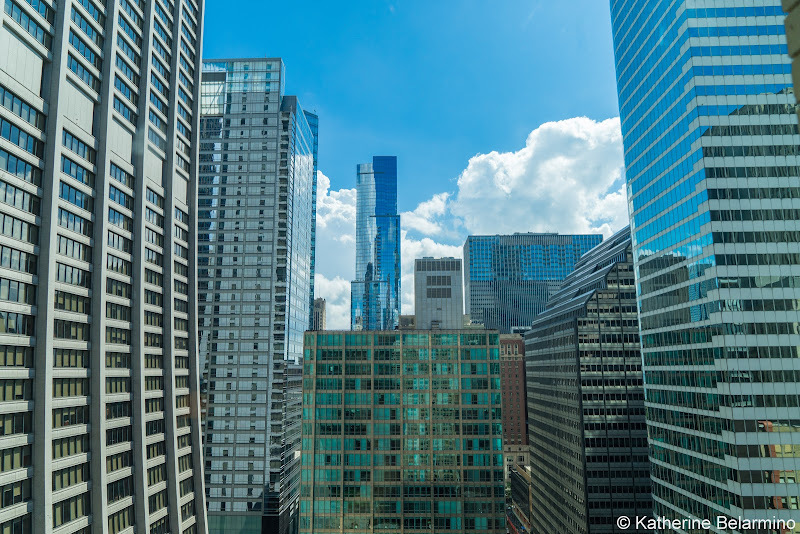 Both offer birds-eye views of the city of Chicago. They each have something unique to offer. 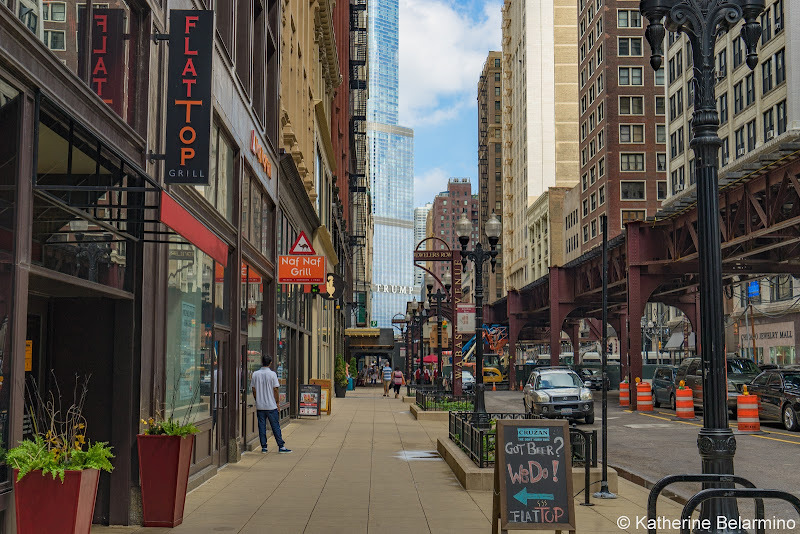 Just a block away from The Red Door Salon & Spa is the John Hancock Center. High up on the 94th floor is 360 CHICAGO. Of the two options, this was my favorite. When we arrived, we were warned that because of the rain storm that had just passed through, the visibility was not very good (only five miles instead of the 55 possible miles on a clear day). 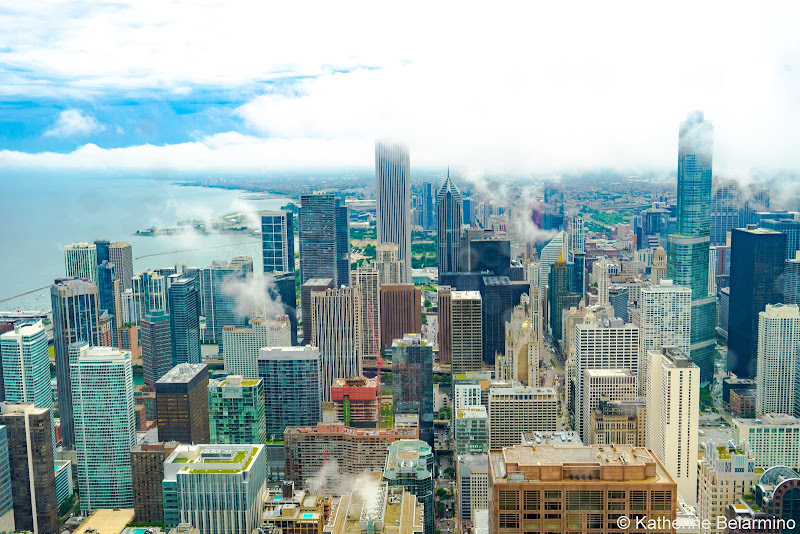 We decided to take a chance and, personally, I loved the view of Chicago with clouds drifting in between the high-rises. 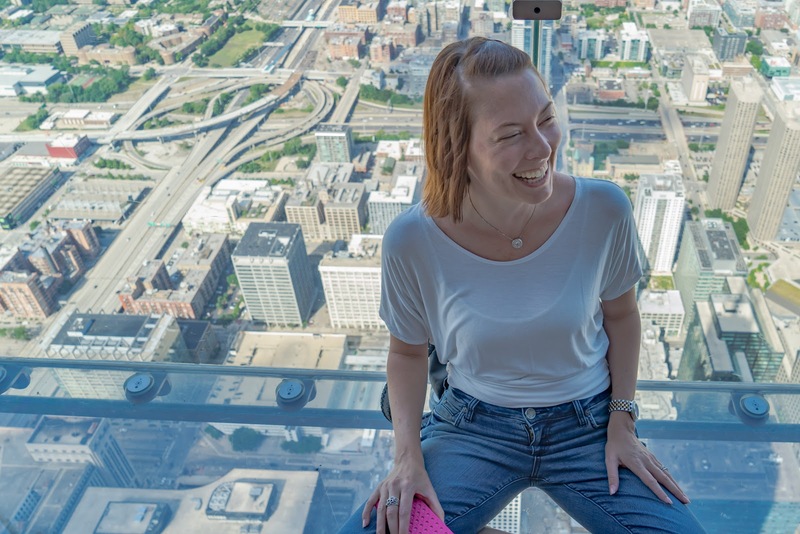 Along with the view, 360 CHICAGO offers visitors the chance to try TILT. We walked into TILT, took our places at a window, and held onto the hand rails as the window and floor literally tilted to a 30˚ angle over Michigan Avenue. 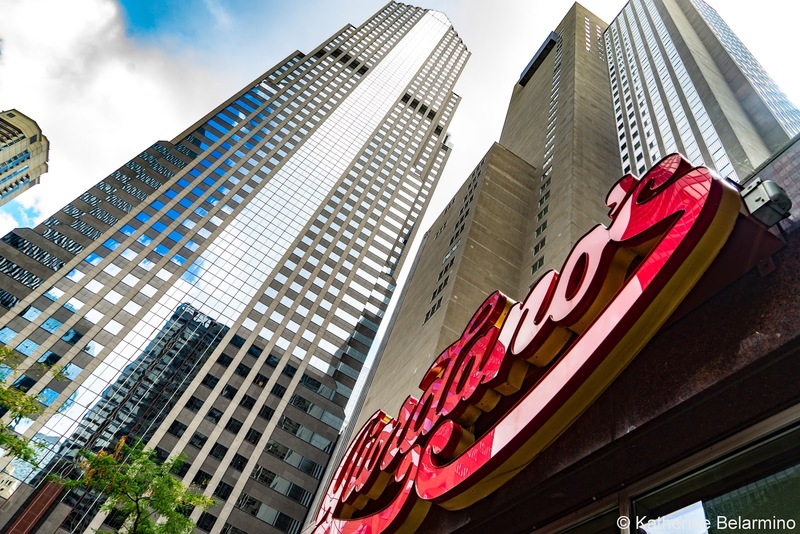 360 CHICAGO was my favorite for a few reasons. 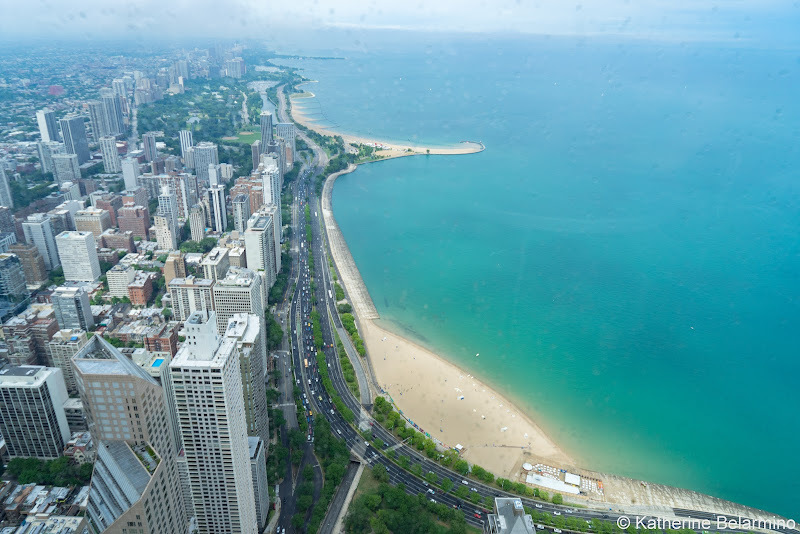 First, I loved the view it provided of Lake Michigan, Oak Street Beach, and the Navy Pier. I also loved that there was a bar for cocktails and snacks and tables and chairs to sit and soak in the view. Cocktails at 360 CHICAGO after spa treatments at the Red Door Spa & Salon were the perfect start to our girls’ weekend in Chicago. Finally, I loved that there was no wait and a smaller crowd than we later experienced at the Willis Tower. 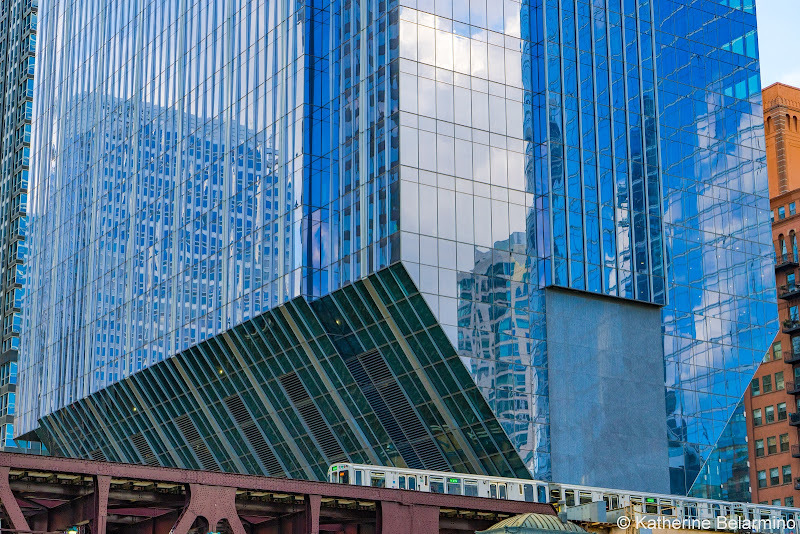 The Willis Tower is in the Loop overlooking the Chicago River. 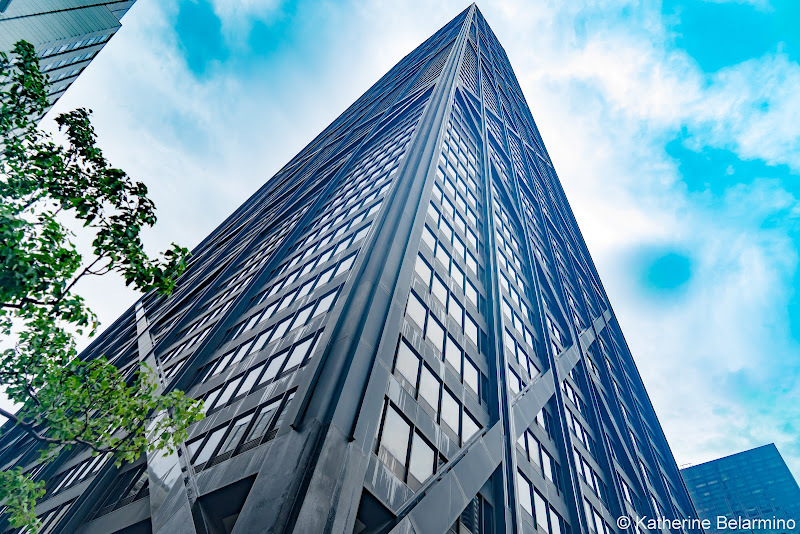 While 360 CHICAGO was my favorite, the Willis Tower’s Skydeck was a must visit for me for one very important reason, Ferris Bueller’s Day Off. As soon as we were off the elevator I was looking for the place they stepped up on the railing and leaned forward, foreheads against the glass. We turned a corner, then turned another corner, and there it was. At first, I was judgmental and jealous all at once when I thought I saw a girl leaning against the glass wearing knee-high white boots and a fringed white leather jacket. And then I realized it was a mannequin. The other highlight on the 103rd floor is The Ledge, glass balconies that extend four feet out to provide views up, down, out, and to both sides. Prepare for long lines and selfie sticks as everyone tries to get the perfect shot. 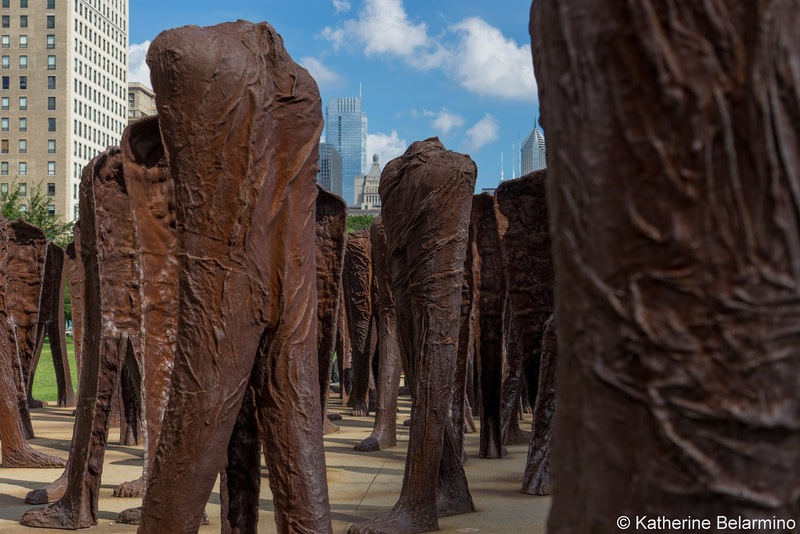 There’s something you should know if you plan on visiting Chicago in the summer. Not only is it hot and humid, summer is Chicago’s wettest time of year, especially August when we visited. Except for a few hiccups, it didn’t adversely affect our girls’ weekend getaway. One of those hiccups was when we visited the Navy Pier. The Navy Pier was in Code Red because of thunderstorms, which meant a lot of the rides and attractions were closed. However, the main attraction that we wanted to visit, the Centennial Wheel, was still running and we had a chance to ride. 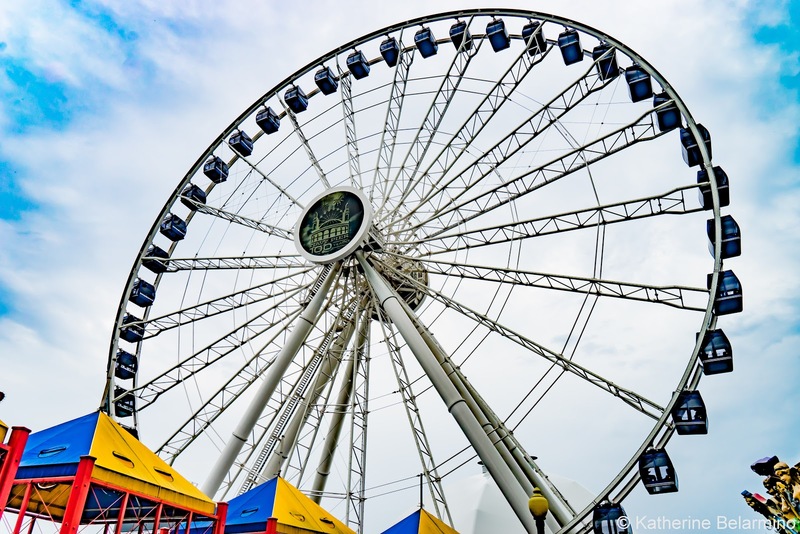 The new Centennial Wheel opened in 2016 to celebrate the Navy Pier’s 100 years. The Ferris wheel is 196 feet tall and has 41 gondolas which each fit up to eight riders and one VIP gondola for four. The ride lasts 12 minutes, which means three revolutions and three chances to see the city from the top. In addition to the Centennial Wheel and other rides, the Navy Pier offers outdoor summertime skating and lots of shopping and dining opportunities. The Navy Pier is also the starting point for many of Chicago’s boat tours. 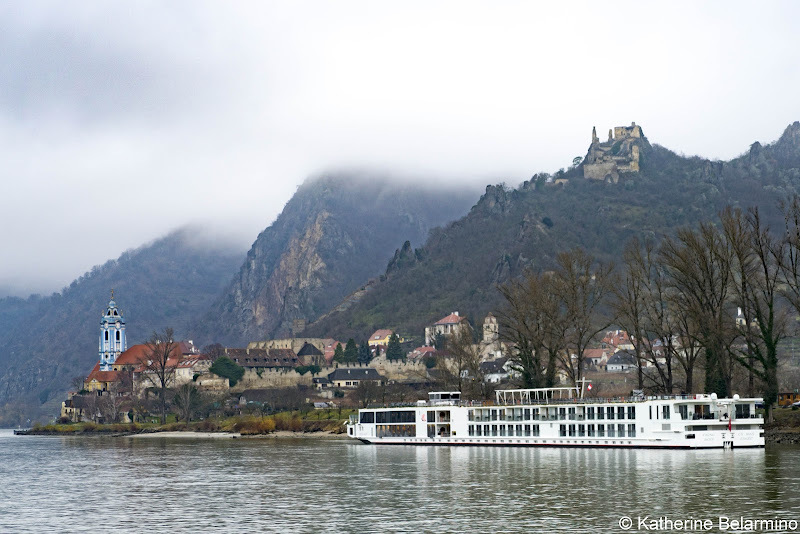 Guided tours are a great way to learn about a destination. 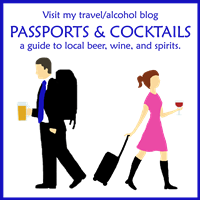 There are a ton of tours offered in Chicago: walking tours, bus tours, boat tours, food tours, beer tours, cocktail tours, mob tours, haunted tours; the list goes on and on. 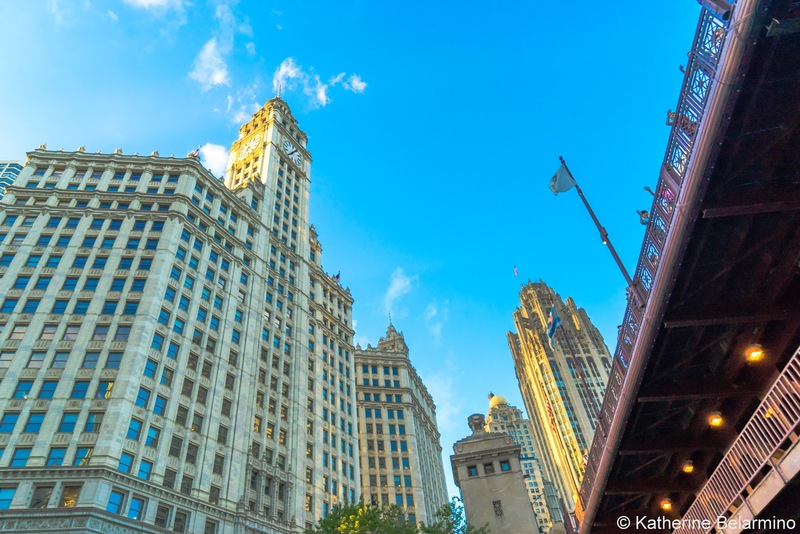 I used Vimbly to discover and navigate the vast selection of tours offered in Chicago. 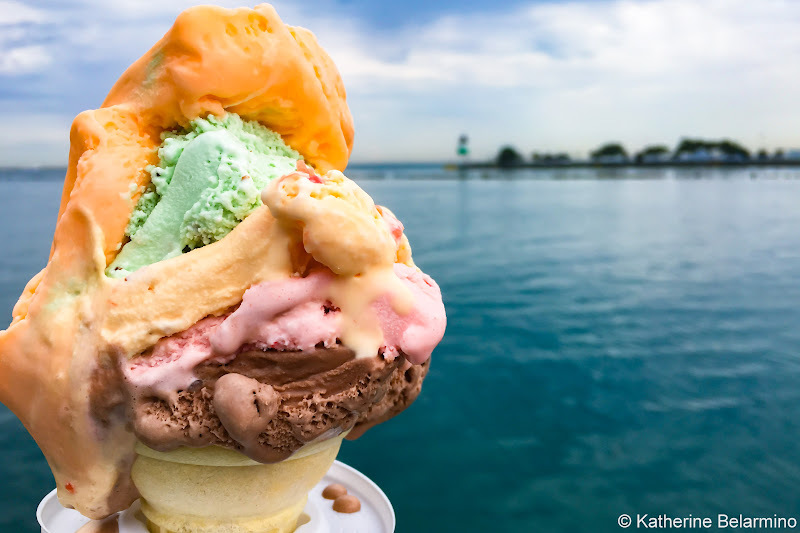 Through Vimbly we booked the Chicago Favorites Food Tour with Bobby’s Bike Hike Chicago. 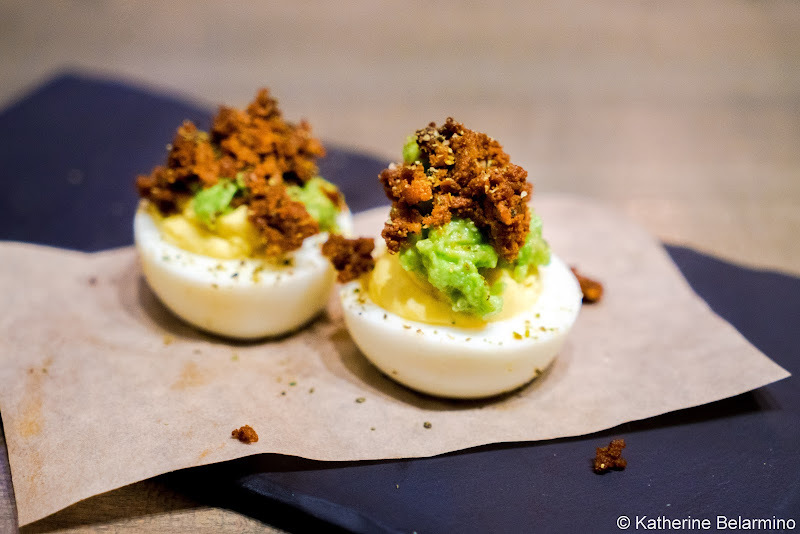 This walking food tour was really a two-in-one kind of tour. Not only did we get to try iconic Chicago foods like deep dish pizza, Italian beef sandwiches, and brownies and taste locally brewed beers, we also learned about Chicago’s history and visited a few of Chicago’s sites. 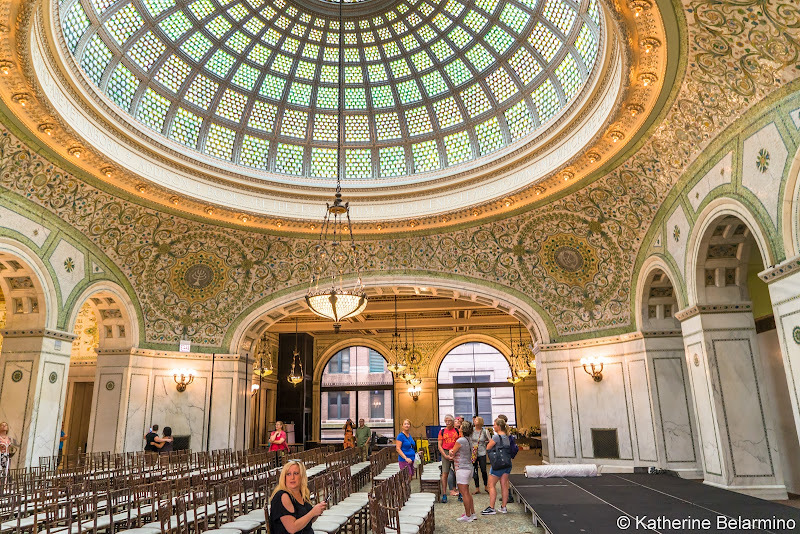 One place we would have never visited or known about if it hadn’t been for our food tour is the Chicago Cultural Center. This was the meeting point for our tour, but we also got to explore it and learn about its history. First, did you know Chicago is also called the second city? Do you know why? It’s not because it’s putting itself second to New York City. It’s because the city was decimated in the Great Chicago Fire of 1871 and the Chicago had to be completely rebuilt. Concerned that all of Chicago’s books had been destroyed, British citizens, including Queen Victoria, donated over 8,000 books to Chicago. A library was established in an abandoned water tank and then moved around for years until a permanent library building was built. The Chicago Public Library opened in 1897 in what is now the Chicago Cultural Center. 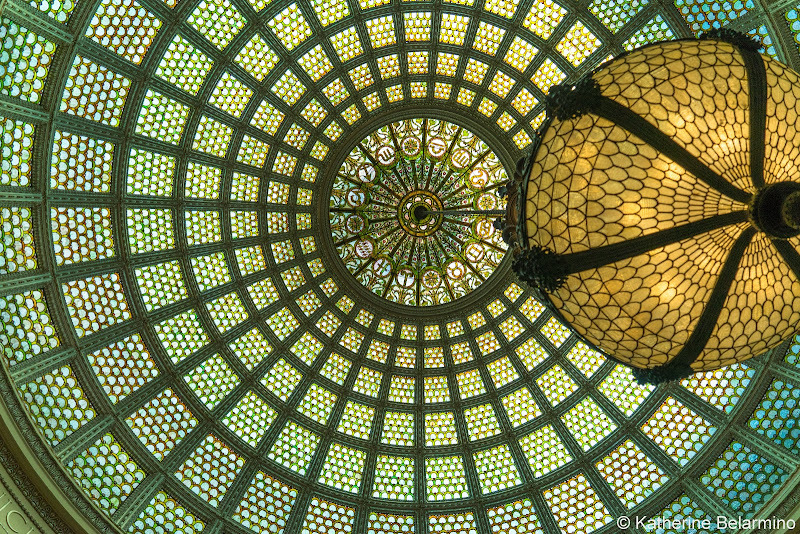 The Chicago Cultural Center’s architecture is the reason to visit. 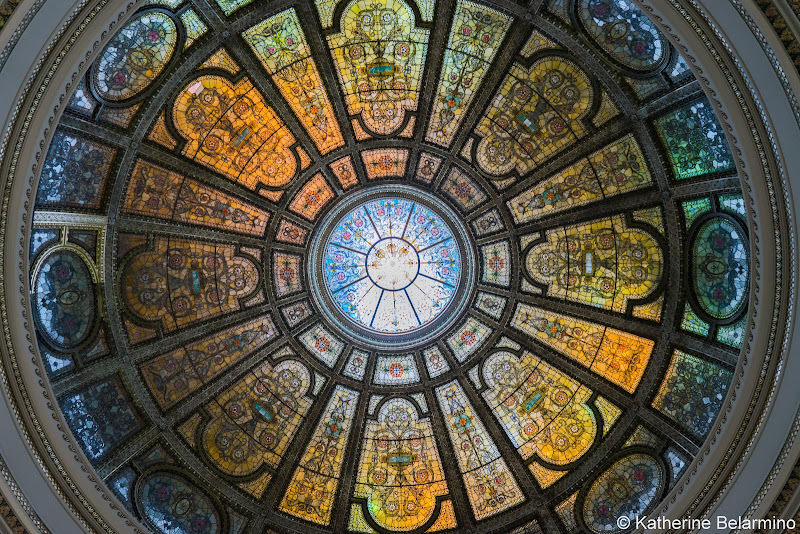 For one thing, the Chicago Cultural Center features two amazing stained-glass domes. The first is the Healy Millet Dome on the second floor in the Grand Army of the Republic Rotunda, made with green, yellow, and blue glass with a floral theme. On the third floor in the Preston Bradley Hall is the Tiffany Dome, which is said to be the largest Tiffany dome in the world. This room is where people picked up the books they had requested. In addition to the gorgeous dome overhead made of fish scale shaped glass and featuring signs of the zodiac, the curvature between the dome and the walls is covered in mosaics of intricate and sparkling designs. 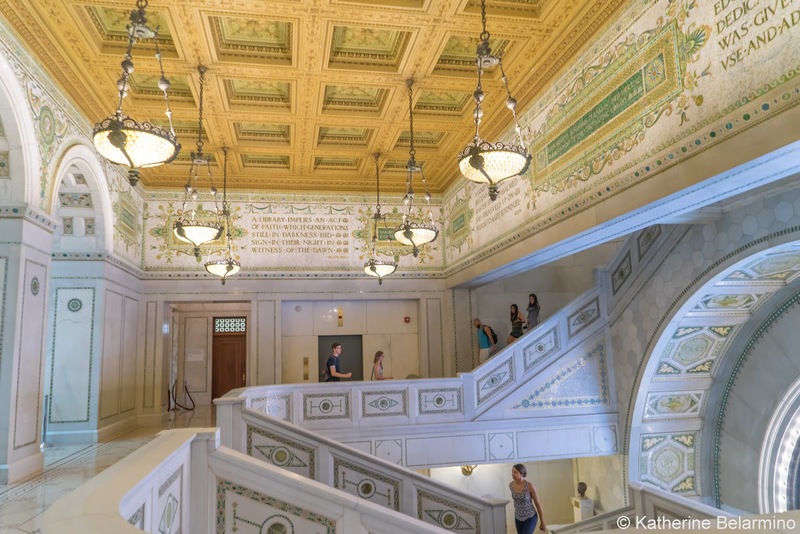 The entryway and staircase leading up to the Preston Bradley Hall from Washington Street are filled with marble, mosaics, and quotes from authors throughout history singing the praises of books and libraries. 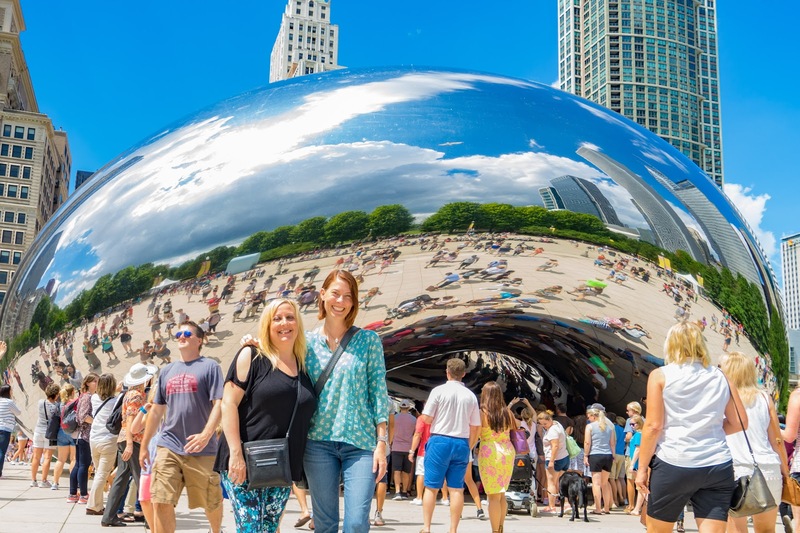 A Chicago site everyone knows that we visited on our walking food tour is Cloud Gate in Millennium Park. Cloud Gate is a sculpture by artist Anish Kapoor. While Cloud Gate is supposed to be a gate, everyone calls it The Bean because, well, that’s what it looks like. Cloud Gate is big and shiny, and it’s curved, mirror-like surface means it produces great reflections of the city as well as of all the tourists who have come to take the perfect Chicago selfie. 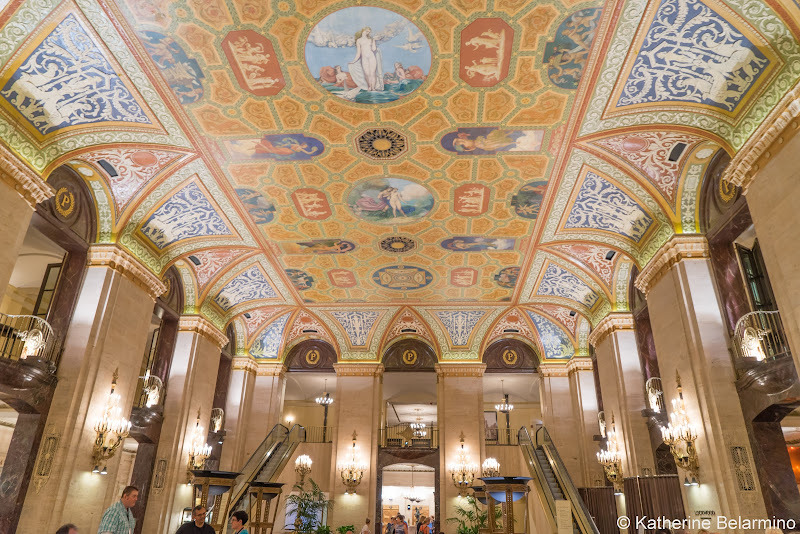 Another of Chicago’s historic sites on our food walking tour was the Palmer House hotel. The Palmer House was a wedding gift from Potter Palmer, a Chicago business magnate, to his bride Bertha Honore, who was 23 years younger. We visited the Palmer House not only to visit a historic site and hear about this legendary woman who amassed a great collection of art which later became the core of the Art Institute of Chicago but to also taste a Palmer House invention, the Palmer House brownie. 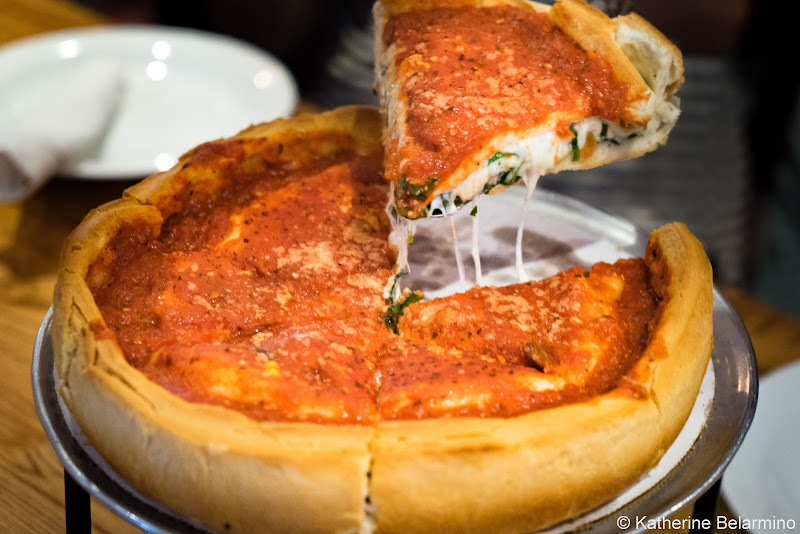 Other food stops on our food walking tour included Giordano’s for Chicago’s famous deep dish pizza, Park Grill for locally brewed beer, Al’s Italian Beef for its namesake, and craft beer and craft soda at Chicago’s oldest restaurant and proud holder of Chicago’s Liquor License No. 1, The Berghoff Restaurant. We also discovered, using Vimbly, a haunted harbor tour aboard Tall Ship Windy. 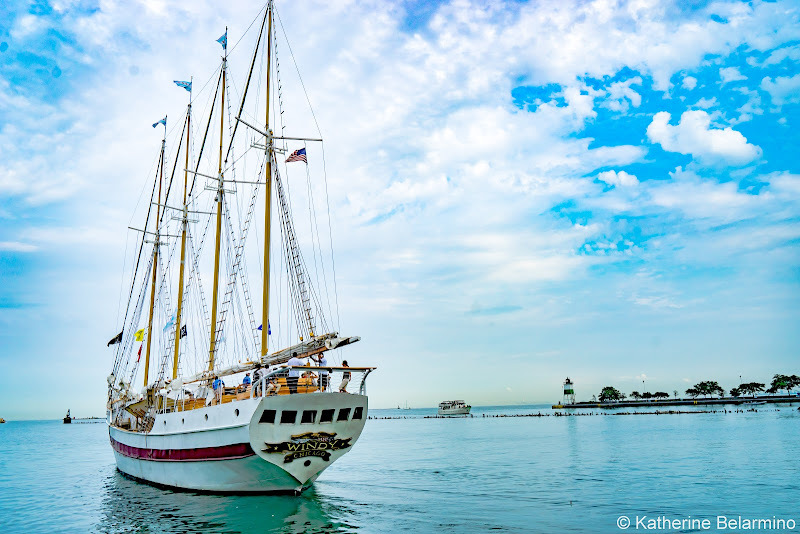 While we caught a glimpse of the tall ship while at the Navy Pier during the day, sadly we didn’t get to experience the nighttime haunted harbor tour thanks to threatening thunderstorms. However, our hopes for a boat tour weren’t completely dashed. The next day we were able to find last minute tickets for one of Chicago’s famous architecture tours with Seadog. Seadog offers a few different cruises, and we chose the Seadog River and Lake Architectural Tour. We liked that the tour not only traveled along the Chicago River through the city for a close-up view of the architecture, but it also cruised out to Lake Michigan for a view of Chicago from another angle. Of course, do beware that also means spending some time moving between the river and lake in a lock. I was really surprised by how great of a walking city Chicago is. 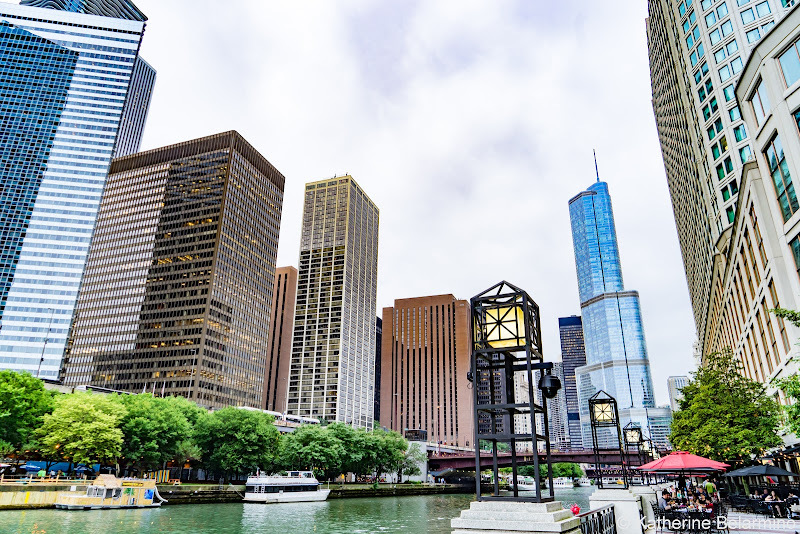 One of our favorite places to walk was along the Chicago River near to where it connects to Lake Michigan. 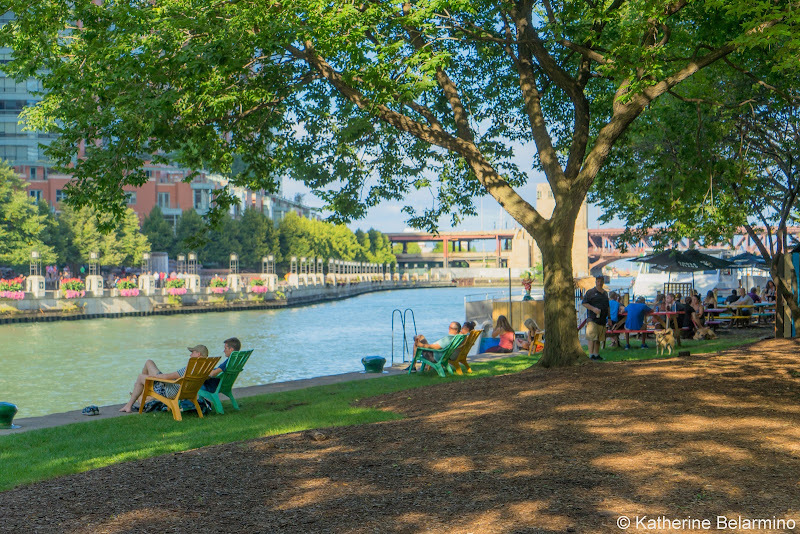 On the north side of the Chicago River is the River Esplanade, a pedestrian waterfront that passes hotels, bars, and restaurants. On the south side of the Chicago River is the Chicago Riverwalk, a green space which passes fun outdoor bars, food stands, and seating areas, as well as a few places to board a boat tour. Something Debbie learned while walking around Chicago before I arrived is that free concerts are hosted in Millennium Park at the Jay Pritzker Pavilion. We were able to add a concert, Tchaikovsky Spectacular featuring the Grant Park Orchestra and pianist Kirill Gerstein, into our girls’ weekend in Chicago. While there are seats in front of the outdoor stage, most attendees grab a free seat on the Great Lawn, which is crisscrossed by a framework that supports speakers, providing excellent audio no matter where you sit. Lawn seating is very casual. You can come and go as you please, bring chairs or blankets, and bring outside food and drink. There are also stands selling beer if you don’t want to bring your own. It is pretty glorious to sit outside and listen to beautiful music surrounded by Chicago’s stunning evening skyline. 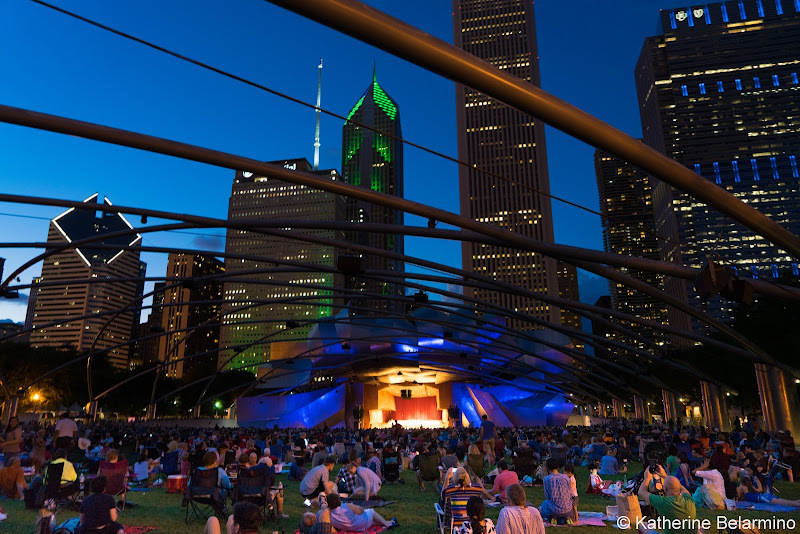 Upcoming events can be found on the Grant Park Music Festival and City of Chicago websites. Somehow, museums don’t feel very girls’ weekend like. 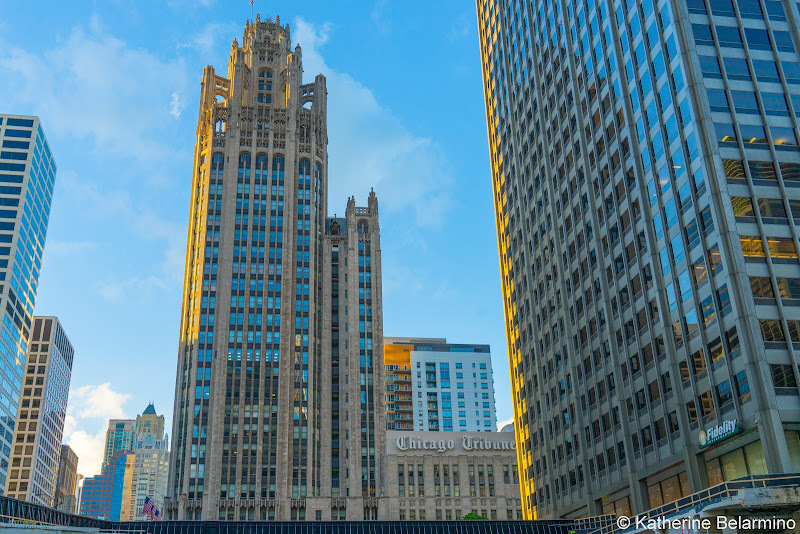 However, we did take some time on our last day in Chicago to visit Chicago’s Museum Campus where some of Chicago’s major attractions can be found. Museum Campus isn’t all art museums. In fact, Chicago’s art museum isn’t even found here. Our first stop in the Museum Campus was the Shedd Aquarium. 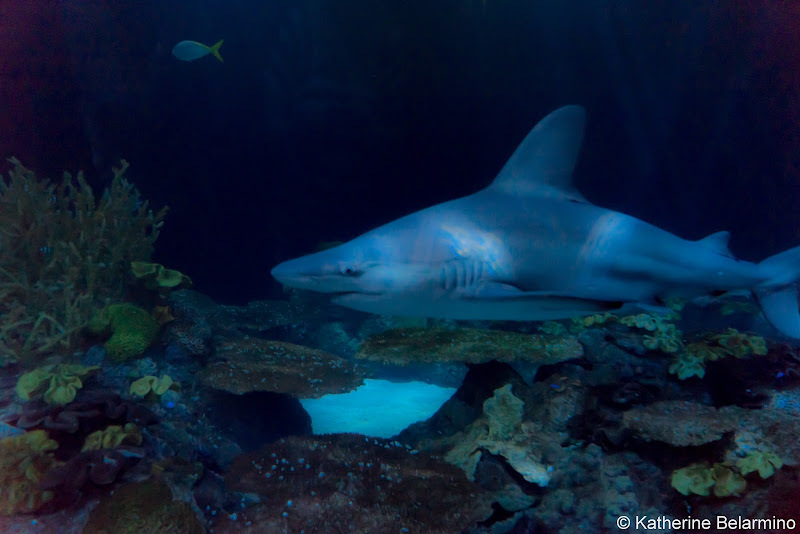 Shedd Aquarium is a leader in rescue and rehabilitation of animals. Thousands of the animals at the aquarium are rescued. There are belugas, penguins, sharks, otters, dolphins, stingrays, and more. In addition to the exhibits, there are live shows, a 4-D Experience, and a stingray touch zone. 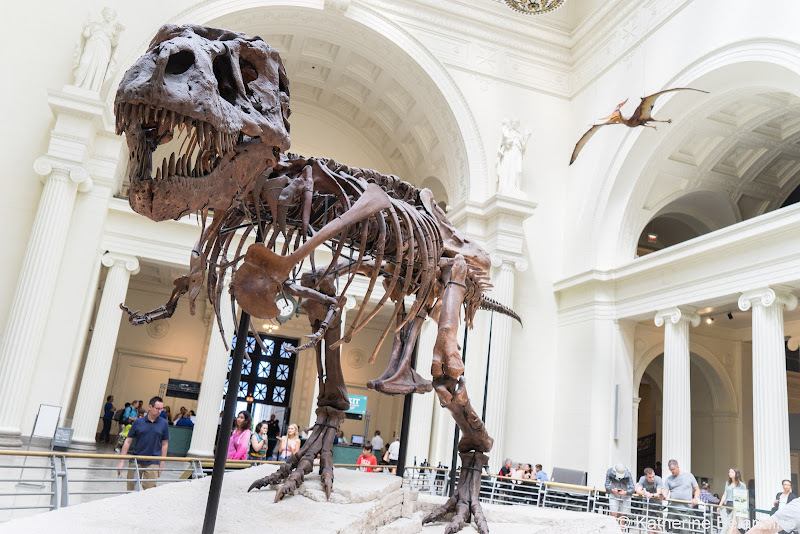 If you’re already at the Museum Campus, it’s worth taking the time to visit The Field Museum, if only to see one thing, SUE, the largest, most complete, and best-preserved Tyrannosaurus rex ever discovered. The Field Museum was founded in 1893 and is one of the best natural history museums in the world. The Hyatt Centric the Loop Chicago didn’t have a rooftop pool, but it did have a rooftop bar, which is essential for a girls’ weekend getaway. 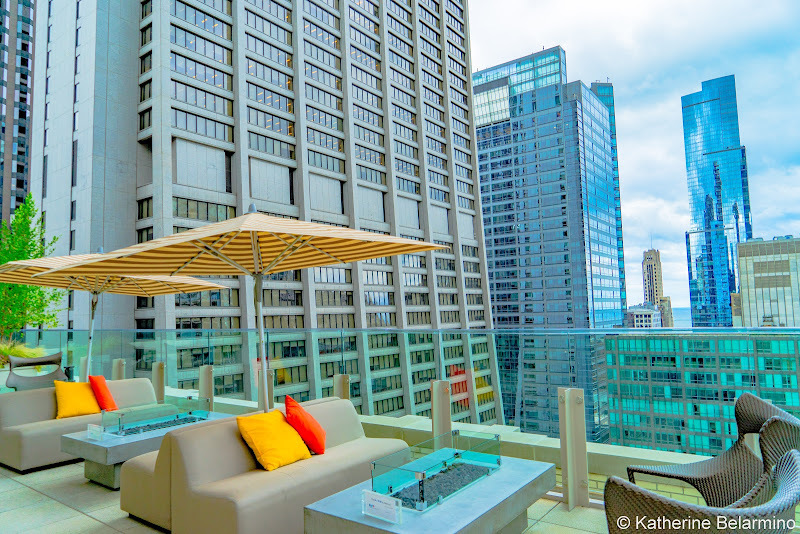 AIRE is located on the 24th floor and provides a 360-degree view of the Chicago skyline. While drinking in the Chicago view, we also drank some of AIRE’s signature cocktails, like Orange is the New Wacker (Cruzan Aged Rum, Cointreau, orange juice, lime juice), More Bang for Your Buck (Malibu Passion Fruit, Midori, pineapple juice, grenadine), and The Monroe Mule (Grey Goose La Poire, lime juice, ginger beer). 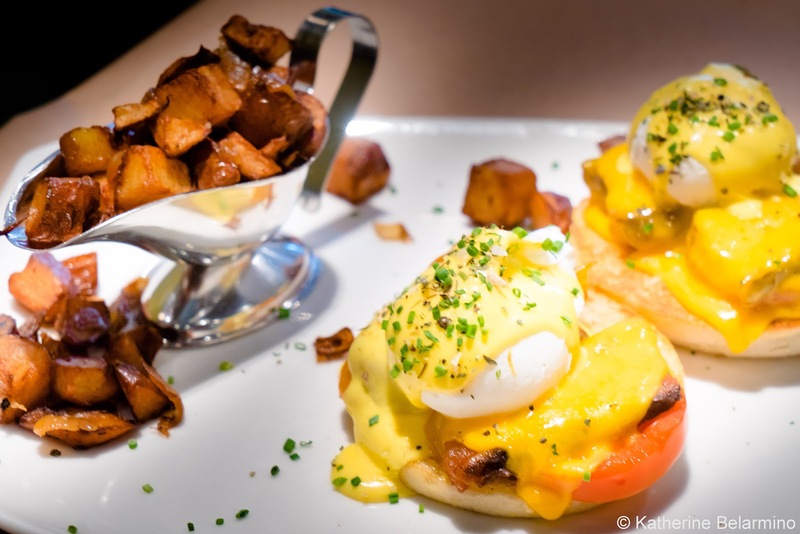 For breakfast, we didn’t have to go very far as we dined at the Hyatt Centric the Loop Chicago’s restaurant Cochon Volant. 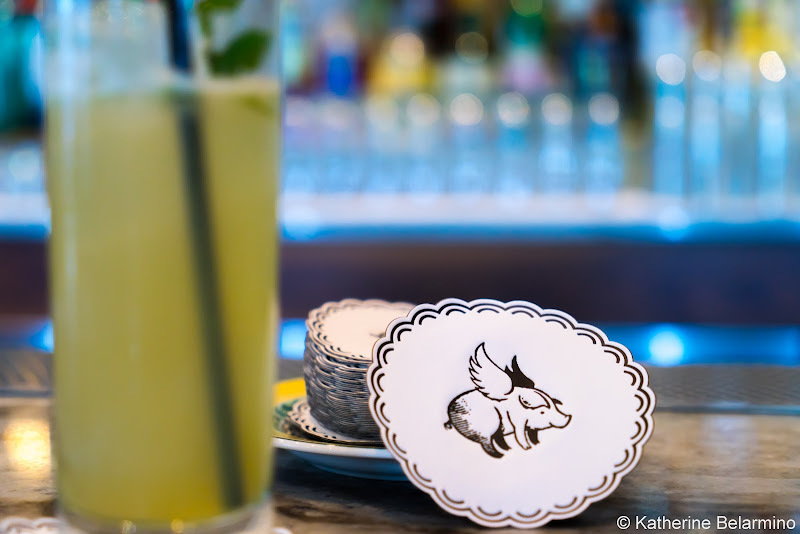 Cochon Volant is a French brasserie that doesn’t look like a hotel restaurant. I went simple with the stone cut oatmeal with brown sugar, banana, and almond milk, while Debbie went with the proper French breakfast of bacon eggs benedict with a house-made English muffin, cage free eggs, double-cut bacon, heirloom tomato, and hollandaise. 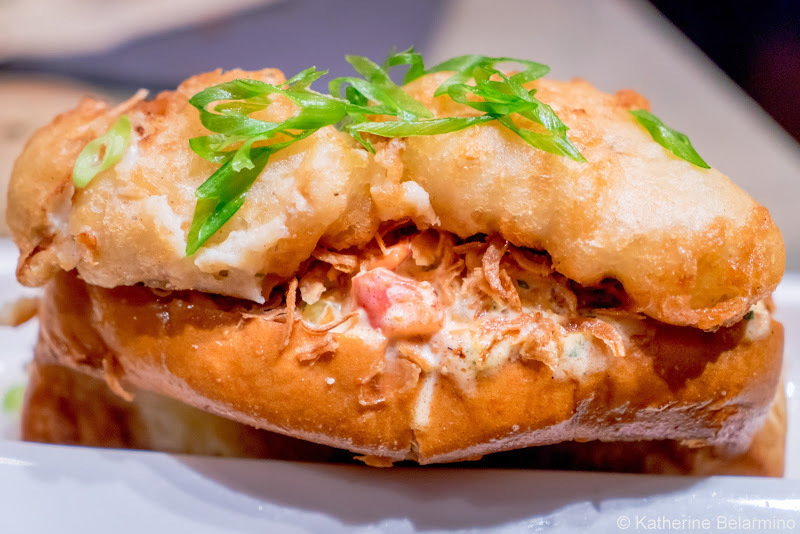 For dinner one night we ate at another unlikely hotel restaurant, filini bar and restaurant in the Radisson Blu Aqua Hotel Chicago. 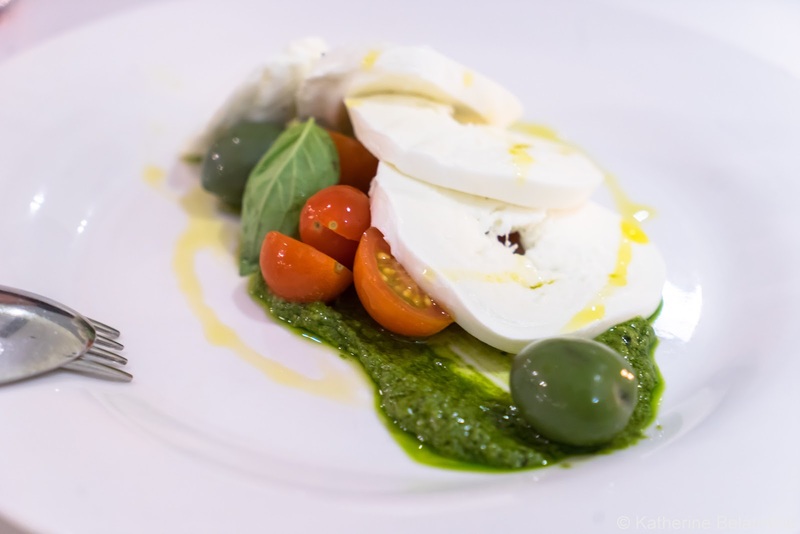 When in Chicago, it is imperative to have Italian food and, surprisingly, this hotel restaurant is a great place for having really good Italian food. 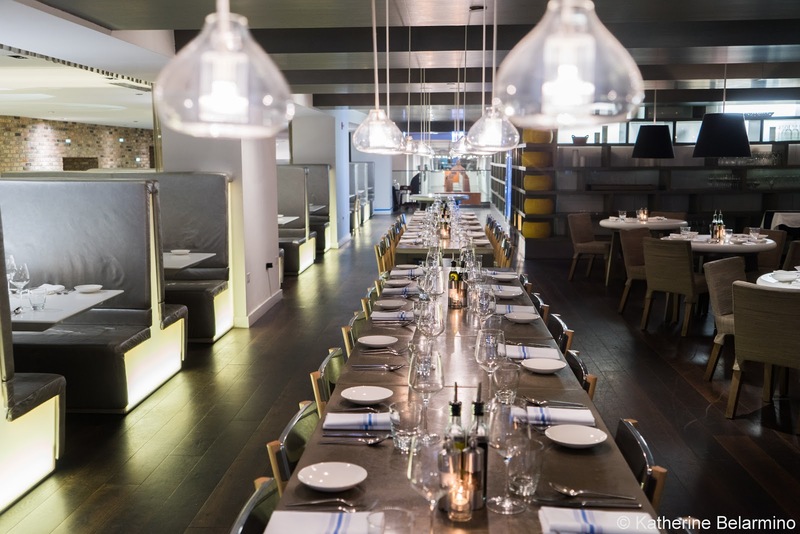 Chicago has a reputation for having great Italian restaurants and filini bar and restaurant is one of them. 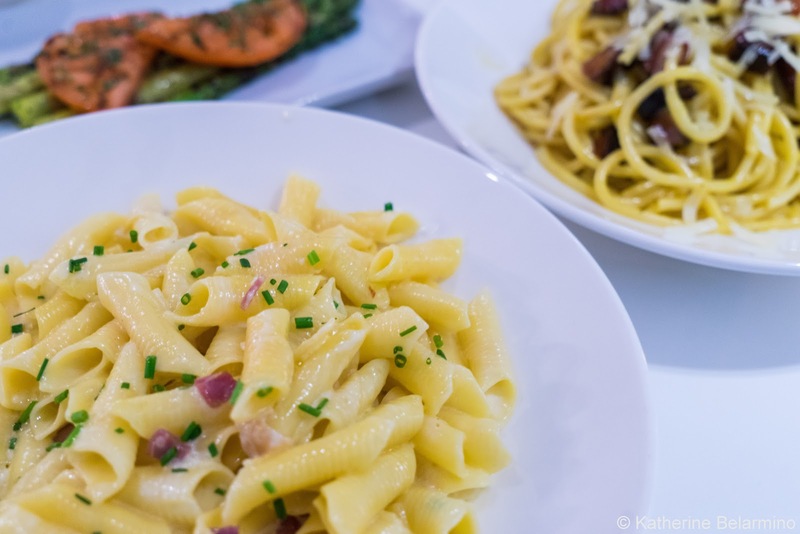 Filini serves not Italian-American food soaked in sauces, but rather Italian food like you can get in Italy: freshly-made pasta and simple fresh ingredients. While the standout of our meal was definitely the fresh pasta, the accompaniments were also excellent, like the buffalo mozzarella with tomato and pesto, asparagus, and one of filini bar and restaurant’s refreshing craft cocktails made with watermelon, basil, and vodka. 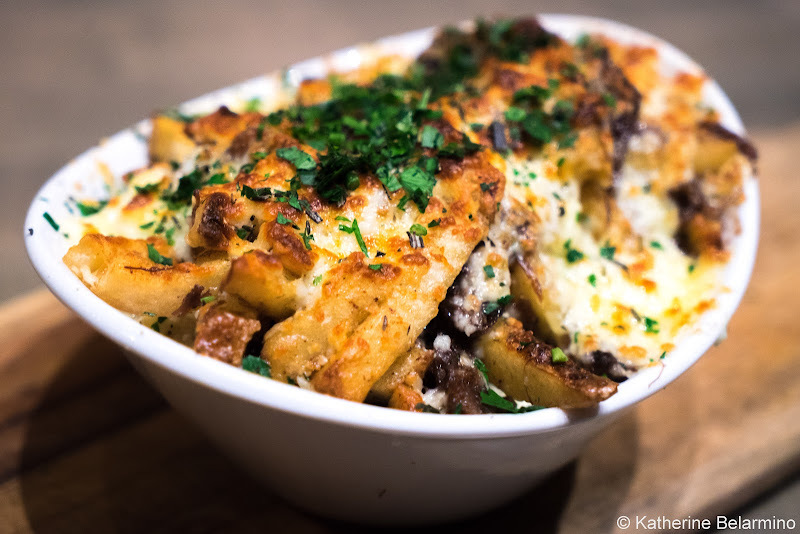 On our last night, we dined at Bottlefork Bar and Kitchen in the River North neighborhood. Bottlefork features locally sourced and globally inspired cuisine with a twist. Bottlefork’s menu is extremely eclectic with items like huevos diablos, deviled eggs with avocado, chorizo, and smoked jalapeño; braised beef cheek poutine with Wisconsin cheese curds; and my absolute favorite, the rich man po’ boy with lobster, foie gras, and crispy fried oysters. 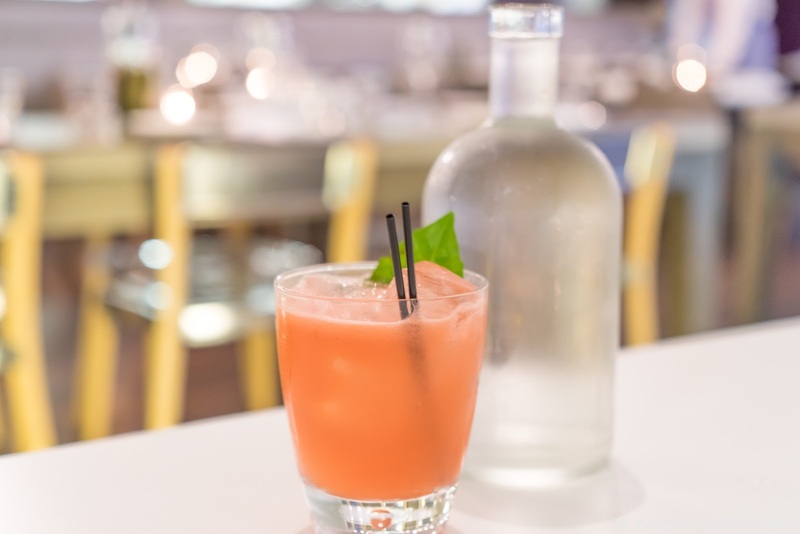 Bottlefork also has an inventive cocktail list. 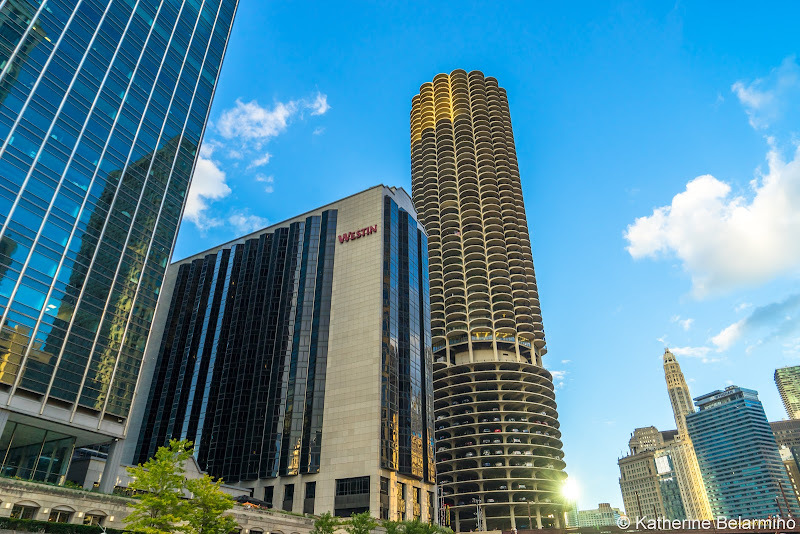 There are many opinions on the best area to stay in Chicago. 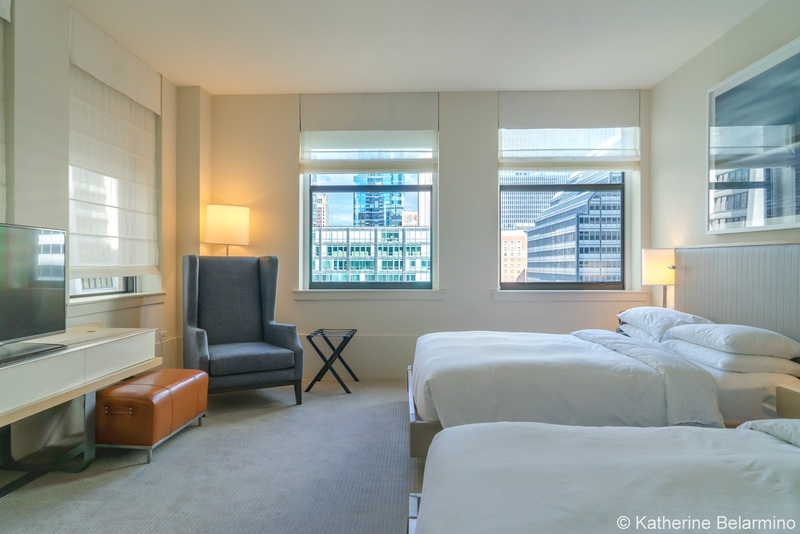 We chose to stay at the Hyatt Centric the Loop Chicago in the Loop. The hotel is in the financial district, which means it is surrounded by office buildings and is quiet at night. If you’re looking to be where all the nightlife happens, this isn’t the place. But, if you are looking to be where it is quiet, but within a few minutes’ drive from the action, then this is a great place to be. While the financial district was quiet at night, there were people out walking along the sidewalks late into the night, so it always felt active, it just didn’t feel crazy like the River North neighborhood which gets filled with people and honking cars (Uber drivers who don’t know how to drive in Chicago according to our taxi driver). The Hyatt Centric the Loop Chicago is very centrally located for seeing the sites. Just a few minutes north is the River North neighborhood and the Navy Pier. Just a few minutes east is Millennium Park. Just a few minutes south is Museum Campus. Just a few minutes west is the river and places like Skydeck Chicago and the opera house. Metro stops are also just a block or two away. Our corner room was large with two queen beds, lots of light, and a great view of the city. The bathroom was also huge, always good for a girls’ weekend, and Debbie even took advantage of the large, deep bathtub. 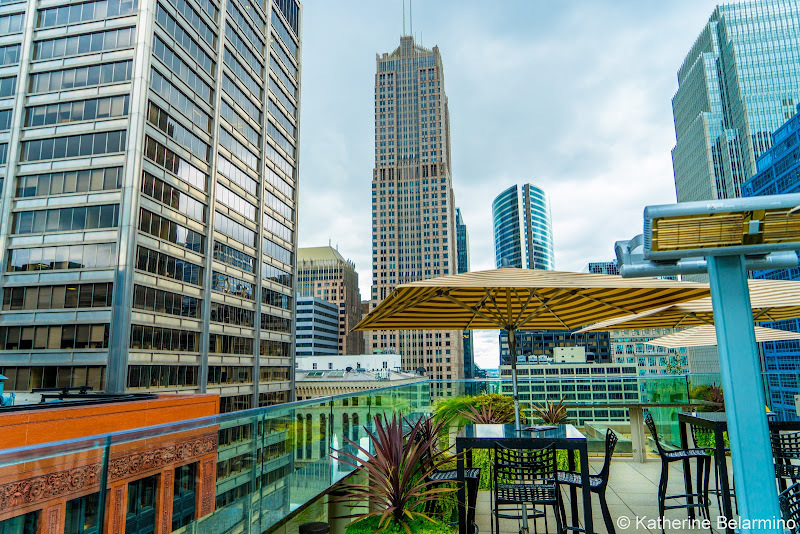 As mentioned above, the hotel also provided amenities like a restaurant and bar downstairs and a rooftop bar offering more great views at the top. 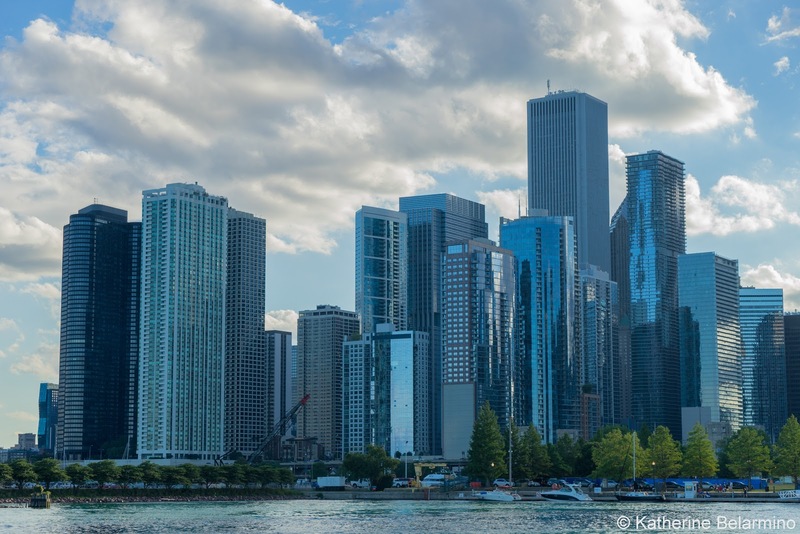 Chicago is served by two airports, O’Hare and Chicago Midway, both of which are a 20 to 25-minute drive from downtown Chicago. There are a number of ways to get to and from the airport, including the L or a taxi. Or, for a little more money than a taxi, you can ride in style with Blacklane, a private car service that will send a driver to meet you at the airport with your name on a sign, help you at baggage claim, and drive you in comfort in a luxury vehicle to your final destination. 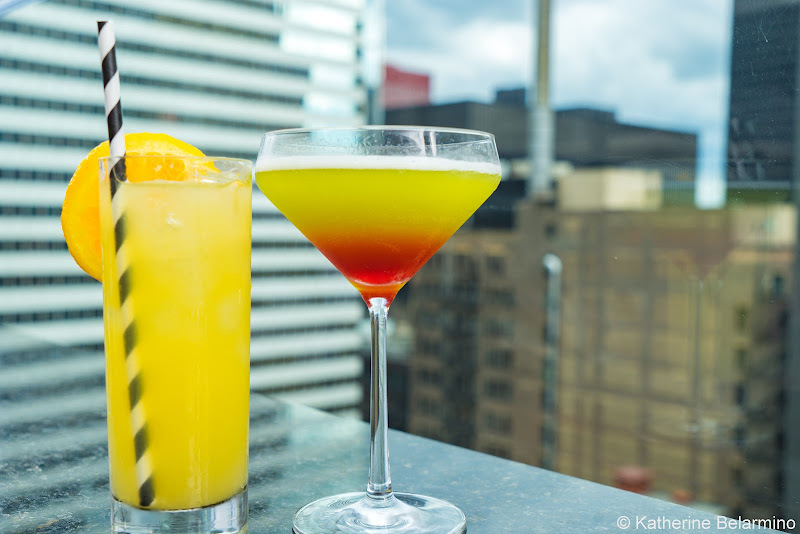 For a girls’ weekend in Chicago, it’s the way to go. Once within downtown Chicago, it is really easy to get around, and we usually went from place to place by foot. 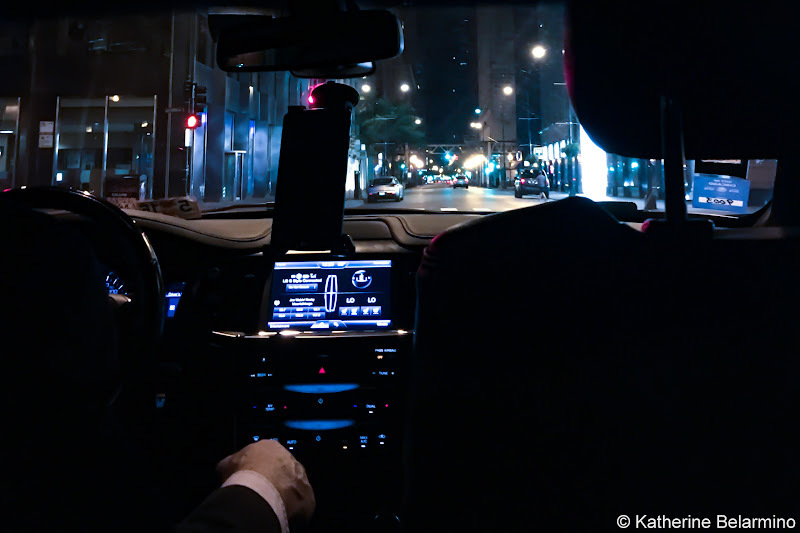 However, we occasionally caught a cab when traveling between the Loop and River North at night, which cost around five dollars. We also used the metro once to get to Museum Campus, but that was mostly just to see what it was like, as we only went a couple stops. When you only have a weekend in Chicago, you don’t have time to stand in line for hours. 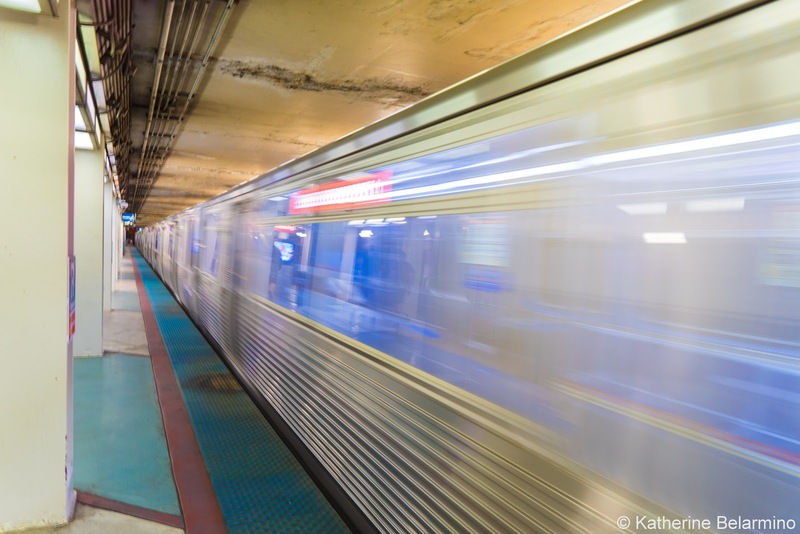 The Chicago CityPASS is absolutely essential if you want to save time and money. 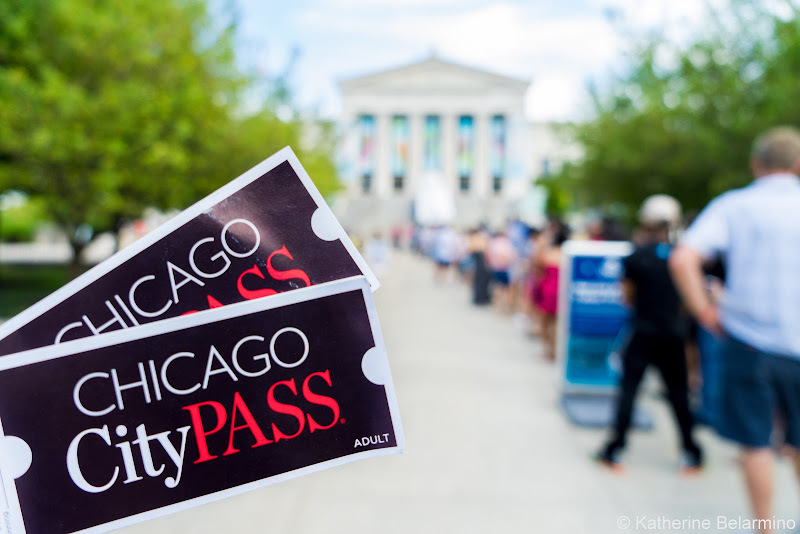 The Chicago CityPASS provides VIP entry to the Shedd Aquarium, fast pass entry to Skydeck Chicago, VIP entry to The Field Museum, VIP entry to the Museum of Science and Industry or express entry to 360 CHICAGO, and VIP entry to the Adler Planetarium or fast pass entry to the Art Institute of Chicago. The value of the Chicago CityPASS was most evident when we visited Skydeck Chicago and the Shedd Aquarium. When we arrived at Skydeck Chicago shortly after they opened, the line was already huge and would have probably been a two-hour wait for us. With the Chicago CityPASS, we bypassed the security line and then we bypassed the line to the elevator. We did get a few looks from people who didn’t understand why we were flying by them. When we left, the line was starting to form down the sidewalk outside. At the Shedd Aquarium, a sign said the wait was an hour and a half from where we would have joined the line. We walked through the doors and had our tickets within 10 minutes. We visited both of these attractions plus the Field Museum before heading to the airport at 4:00 p.m. There is no way we would have been able to visit them all that day if we had to wait in those obscenely long lines. 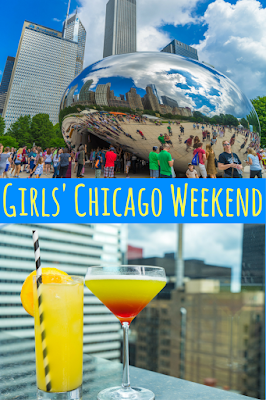 Chicago is the perfect destination for a girls' weekend getaway, or any kind of weekend getaway really. Chicago is a beautiful, walkable city with stunning architecture, great food, and attractions for any kind of traveler. 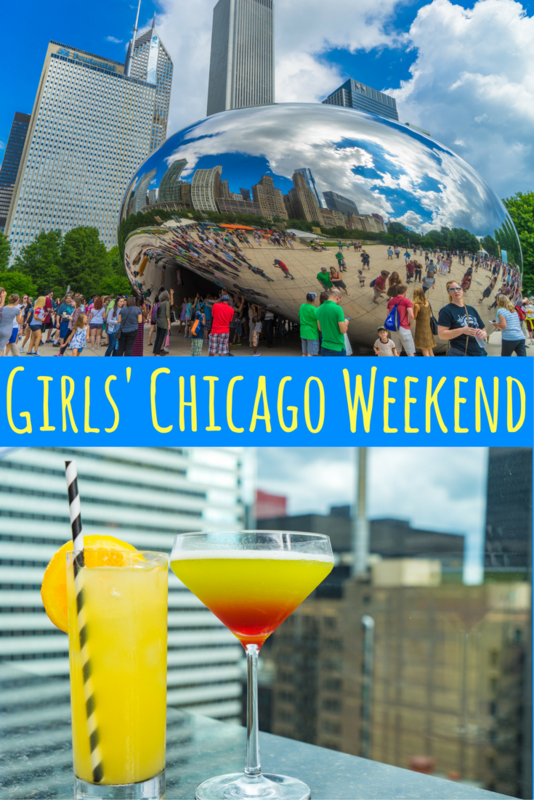 Thank you to Hyatt Centric the Loop Chicago, The Red Door Salon & Spa, Choose Chicago, Vimbly, Blacklane, and filini bar and restaurant for hosting our girls’ weekend in Chicago and making this post possible. As always, all opinions are my own. This article contains affiliate links. 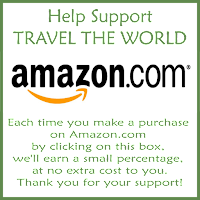 If you book through them it costs you nothing extra and we earn a small commission which goes towards running this website and bringing you more travel stories.